President Donald Trump walks from the podium after speaking at Mar-a-Lago in Palm Beach, Fla., April 6, 2017, after the U.S. fired a barrage of cruise missiles into Syria. Unlike his predecessor Barack Obama, America's new leader Donald Trump demonstrated he’s willing to take extremely harsh measures in Syria on April 7. The attack on the Shayrat airbase resulted in minimal losses, but it begs the question: How will Moscow and Damascus respond? 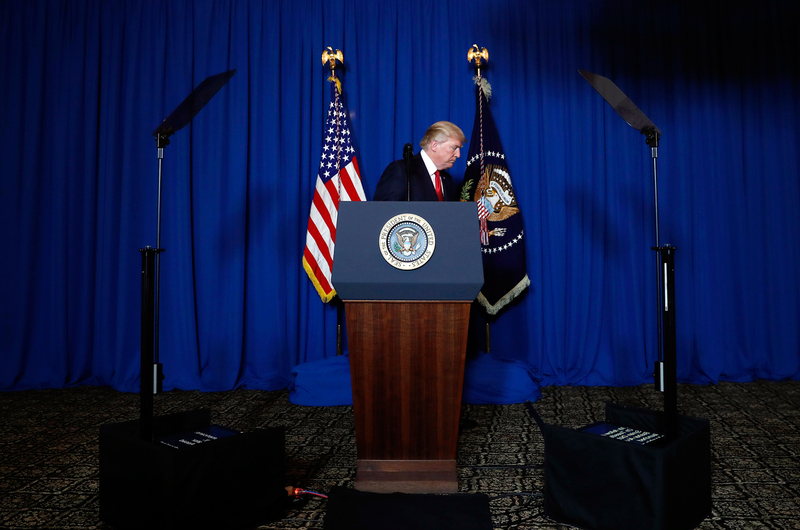 The opinion voiced by several experts that the U.S. strike targeting a Syrian military airbase was an “emotional reaction” by President Donald Trump is questionable. The timing was excellent for Washington and the possibilities of starting a direct conflict with Russia were minimized. The Russian military had been warned of the strike beforehand, something that helped Moscow’s ally Syria avoid serious losses, since its army had begun evacuating the base in advance. The strike coincided with Chinese President Xi Jiping's visit to the U.S. and Trump showed the whole world the decisiveness that, according to him, Obama had lacked. Now the Kremlin must decide how to react to the direct and full-fledged attack on its ally. America’s first direct strike on President Bashar al-Assad's troops since the beginning of the Syrian Civil War will completely change the balance of power in the region. It also seriously hinders the success that the Syrian government has made over the last year and a half, backed by Russia. Basically, an "all-against-all" war has begun in Syria. The Kremlin has always believed that stability in the region can only be guaranteed if territories controlled by the moderate and radical opposition are returned to Damascus. The U.S. strike effectively rewrites the rule book, or throws it out of the window completely, meaning that Assad can now wage war against any group that opposed him. However, Syria’s army, which has been weakened by five years of war, is not capable of doing so. The bombing is also likely to suspend cooperation between the Western coalition in Iraq and the Russian army in Syria, which could easily play into the hands of an ISIL counter-offensive. Moreover, now Damascus will act with caution, knowing that repeated, more effective American strikes are possible. However, with the help of Russian air defense resources Assad’s government can fully minimize the consequences of the attacks, although they will basically lead to open confrontation between Washington and Moscow. The scenario of such a conflict will resemble the one in Vietnam when Soviet anti-aircraft gunners shot down American planes. Considering the fact that for now there is no real evidence of Damascus having used chemical weapons, it’s clear that Moscow will appeal to the international courts on behalf of its ally, but will unlikely count on substantial support. Furthermore, Washington's open demonstration of force will strengthen its allies' conviction that Assad must be pressured to step down to make way for a coalition government. Such a scenario, which means defeat for Moscow, is unacceptable for the Kremlin. That’s why Russia's only response is increasing support for Damascus and ensuring air security over Syria's territory. All this will significantly bring the world closer to a new global conflict. Also, Russia's decision not to use its air defense systems to counter the attack on the airbase gives the impression that the strike was a sort of "attack on the agreement (the memorandum on flight safety over Syria between America and Russia)," something that proves Washington and Moscow's unwillingness to significantly strain relations. However, now the Kremlin and Damascus need serious gains in their fight against Islamist radicals and the opposition, which will in turn test Assad’s political endurance and the Kremlin's willingness to continue supporting him. Artem Kureev is an expert from the Moscow-based think tank “Helsinki+” that deals with protecting interests of Russians living in the Baltic countries. Kureev graduated from Saint Petersburg State University’s School of International Relations. His opinion does not reflect the position of RBTH or its staff.